University of California, Irvine is launching a new e-sports initiative this fall, which it's describing as "the first of its kind at a public research university." As part of the initiative, UCI is constructing a 3,500-square-foot gaming arena with 80 high-end gaming PCs from iBuyPower "loaded with popular gaming titles" and a webcasting studio that will live stream gaming events, such as multiplayer competitions. UCI will also be offering up to 10 academic scholarships to students who make UCI's eSports team, supported in part by iBuyPower. "UCI eSports will be built on four pillars: competition, academics, entertainment and community," said Thomas Parham, vice chancellor for student affairs, in a prepared statement. "We hope to attract the best gamers from around the world, and our academic programs in computer gaming science, digital arts, computer science, engineering, anthropology, law, medicine, neuroscience and behavior create a strong foundation for research and inquiry related to gaming." UCI didn't specify which of iBuyPower's systems it would be installing. The company's base units start at $569 and range up to $1,239 (not including the price of the operating system). Systems can be tricked out to ridiculous proportions, however, with such options as triple graphics cards and dual striped 2 TB SSD drives pushing the $10k barrier. The center will be open to non-team members as well. According to information released by the university, those students will be able to use the gaming center for leisure gaming or for academics and research projects. 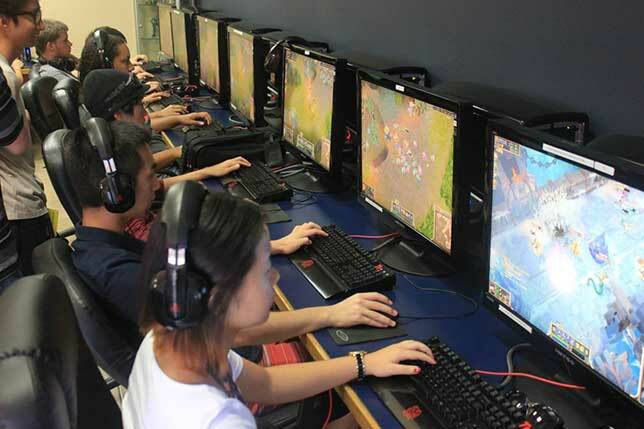 UCI reported that 72 percent of its students identified themselves as gamers in a survey, and 89 percent supported starting an e-sports team. "It has been a dream for many of us on campus that UCI recognize the importance of e-sports and create a space and a program that cater to the large community of gamers at the university," said Jesse Wang, president of The Association of Gamers, also in a prepared statement. "The eSports team and the arena will ensure that UCI continues to be a leader and trendsetter in collegiate e-sports." In addition, Riot Games, publisher of League of Legends, is supporting the initiative and has pledged to "work with UCI to offer a premium League of Legends gaming experience." Additional details can be found on the UCI eSports site.